The biography of Elton John is the story of one of the best selling musicians of all time. According to Rolling Stone magazine, only Madonna and The Beatles have sold more records than John. His career spans four decades and counting in the industry. 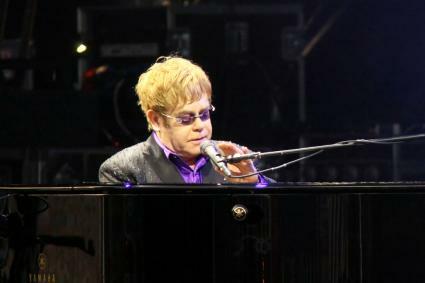 Elton John's birth name is Reginald Kenneth Dwight. He was born March 25, 1947 in Pinner, Middlesex, England, and although both of his parents were musicians and music fans, in later years John would claim that his childhood was creatively restrictive. John's musical talent was apparent by age three, when he began playing music by ear on the piano. His parents enrolled him in lessons at age 7, and by 11 he had won a scholarship to the Royal Academy of Music. Despite his musical talents, his father pressured him to study for a more stable profession. On the other hand, his mother, who had divorced his father and remarried by this time, arranged a standing Friday, Saturday and Sunday night gig for John at a local pub when he was 15. John gained a large local following for his cover versions and original numbers. In 1964, John put together a group of local musicians under the name Bluesology. John was fascinated with blues music at the time, and soon Bluesology became the go-to backing band of choice for touring blues musicians. In 1966, he responded to an ad looking for a songwriter in seminal British music publication NME. This proved to a fateful decision as it was through that ad he was hooked up with lyricist Bernie Taupin, who would go on to become his long term songwriting partner. Taupin and John churned out song after song in the late 60s and wrote for many of the decade's top artists. By the 70s, however, John decided it was his turn to step into the spotlight. In early 1970, Elton John's solo, self titled debut album was released. Initially the response was lukewarm, but the second single, Your Song, helped put John on the map both in the UK and U.S. A second album, Tumbleweed Connection, came out in October of that year. John adhered to this two album a year release schedule for several years. 1973's Don't Shoot Me I Am Only the Piano Player spawned some of John's most recognizable tracks, including Crocodile Rock. The next album, Goodbye Yellow Brick Road, went to number one in the U.S. and spawned five successful singles. A frantic release and touring schedule proved to finally be too much in 1976, when John announced he was taking a break from music. The move also came in the wake of the backlash from a Rolling Stone magazine interview in which John claimed that he was bisexual. John stayed largely out of the public eye until 1979. His songwriting partner had worked with other artists while he was taking his break, but Taupin returned and he and John returned to writing music together. John never quite returned to the same hectic schedule he kept during the 1970s, but some of his biggest selling hits came during the 1980s and 1990s. Of special note is the reworked version of Candle in the Wind that John performed at Princess Diana's funeral. That song, dubbed Candle in the Wind 1997, went on to become the biggest selling single in history. In later years, touring became more important than new music. Also, John became a tabloid staple, with his feuds and personal life getting as much - if not more - press attention as his music. Speculation about his sexuality dogged John from very early in his career. After claiming to be bisexual in his Rolling Stone interview and a four year marriage to a female German recording engineer, John said he was not bisexual and was actually gay. Since then, he has become a vocal advocate for gay rights and has confronted musicians he believed to be homophobic, including Axl Rose and Eminem (he later reconciled and performed with both). He is married to his partner David Furnish. They have been together since 1993. Although they have no children, John is the godfather of 10 children, including the children of Victoria Beckham and Elizabeth Hurley. John battled drugs and alcohol sporadically through his career. Rehab in 1990 helped John get sober. John is also well known for his lavish spending. Press accounts emerged in 2000 that the artist spends roughly GBP 1.5 million per month.